Within hours of Typhoon Haiyan’s massive destructive force being broadcast, ChildFund’s generous supporters were on the phone, on our website and sending letters – all generously donating to our Philippines Emergency Fund. 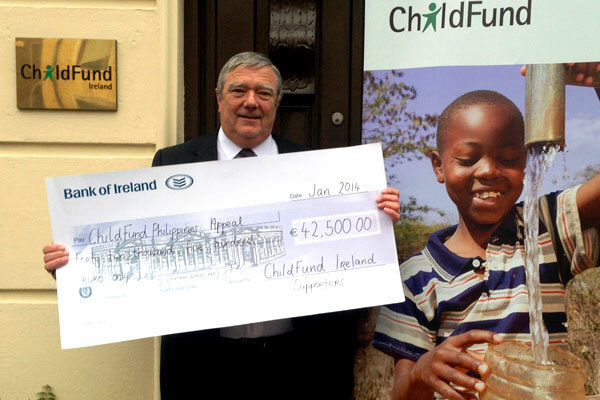 Within six weeks we found that your donations had reached an amazing €42,500 and counting. This message form Meriam Blancaflor in our Philippines office shows what a difference this support has made for children and their families in the areas devastated by this disaster. “I am currently in Ormoc City for our emergency response. On behalf of the Philippines Office, please extend our gratitude to all our sponsors who shared their resources to help our children and families affected by Typhoon Haiyan. ChildFund Philippines is not only helping our enrolled children but other children in areas that we identified to be our response areas. With an established presence in the Philippines, ChildFund was able to respond to the disaster immediately. Following rapid assessments, we have been focussing on the hardest hit areas of Ormoc City, Tacloban City, Palo and Tolosa in Leyte, Bantayan Island in Northern Cebu and Roxas City. During the initial Relief Stage you helped us make the difference between life and death. Now, as we move on to the Recovery phase, your continuing support will help us rebuild the families, homes and livelihoods that Typhoon Haiyan shattered. Thank you so much!